Several academics are arguing for euthanasia for those 'weary of life'. Recent articles in the Journal of Medical Ethics push for law reform to be consistent in our ethical reasoning. This article is written by Xavier Symons and published on November 2 on Bioedge. The authors - including bioethicists Julian Savulescu and Jukka Varelius - suggest that euthanasia is ultimately justified by existential suffering - a despair in life - and not some kind of physical illness. As existential suffering can come in many forms, be it a 'diagnosable' illness or non-medical despair, it should be permitted for those who, though not ill, have lost hope and have no prospect of regaining meaning in their lives.
" whether the suffering of this particular patient is severe enough to make his life not worth living and whether there is significant hope that he after all could recover to live at least a tolerable life. Addressing these questions involves considering existential issues relating to the value of the kind of life this patient can live and the question of what degree of hope ought to be deemed significant enough." Varelius suggests that questions of the worth, meaning and value of life are the key considerations when deciding whether to grant euthanasia. He proposes that the presence of medical illness may not be as important a consideration as we once thought it was. "If we accept existential suffering as a valid criteria, trying to distinguish the 'unbearable suffering' from illness and the 'unbearable suffering' of incarceration is meaningless - something the resourceful and compassionate Belgium laws acknowledge." 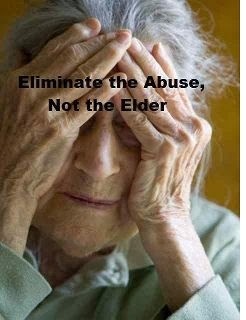 It is clear that these academics have little to no understanding of the societal scourge of elder abuse. Euthanasia for any reason and no reason. Dutch doctors support euthanasia for loneliness.